Northants will be aiming to get their Specsavers County Championship campaign properly up and running against Warwickshire at Edgbaston on Friday, following an encouraging performance in their weekend defeat to Pakistan. The County ended up losing to the tourists by nine wickets over four days’ play at a sun-kissed County Ground, but there were signs that the team is finding some kind of form. 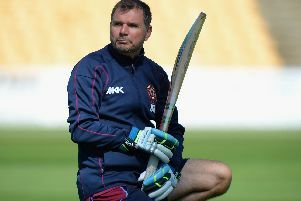 That will be good news for head coach David Ripley, who has already seen his team lose to Middlesex and Warwickshire this season, with their third fixture a washed out draw with Durham. Rob Newton skippered the County against Pakistan in Alex Wakely’s absence, and he caught the eye with his second innings 118 that was the backbone of Northants’ total of 301 all out. The team had resumed on Monday morning on 240 for five, but once Newton lost his wicket to Mohammad Abbas to make it 270 for six, the County collapsed, with Abbas finishing with four for 62. Leg-spinner Shadab Khan took four for 80, including the final two Northants wickets of Brett Hutton and Gareth Wade in consecutive balls, having also claimed six wickets on day one. He finished with match figures of 10 for 157. Imam-ul-Haq (59no) and Haris Sohail (55no) then saw the tourists through to 134 for one from just 27 overs, with the one wicket to fall a run out. Pakistan now play Ireland in the hosts’ inaugural men’s Test in Malahide on Friday (May 11), before they start a two-match series against England on May 24. The County begin their four-day clash with Warwickshire on Friday.